(Photo by Joseph Gerber) Hazmat teams responded to a rollover wreck near Hazelgreen on Thursday. PULASKI COUNTY, Mo. 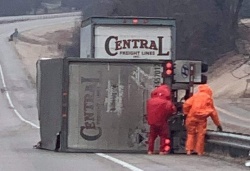 (March 2, 2019) — Snow-slicked roadways on Thursday led to numerous crashes including a hazardous material incident on I-44 near Hazelgreen, but only two of the county’s many wrecks resulted in injuries. According to Missouri State Highway Patrol troopers, the Hazelgreen multivehicle wreck included only one injury: Steven T. Gutierrez, 53, of Waynesville, who had been driving westbound on I-44 about 7:50 a.m. when he lost control of his 2005 Ford F-250 pickup on the icy roadway, slid off the road and struck a bridge rail. Gutierrez, who had been wearing his seatbelt, suffered minor injuries and was transported by Pulaski County Ambulance District personnel to General Leonard Wood Army Community Hospital. His vehicle was moderately damaged and removed by T.C. Towing. Missouri State Highway Patrol troopers and Missouri Department of Natural Resources personnel remained on the scene until around 4 p.m. of the I-44 multivehicle wreck at mile marker 149, west of Richland Exit 150, but some firefighters cleared the scene as of 1 p.m. even though the westbound lanes remained shut down. According to Waynesville Rural Fire Protection District Chief Doug Yurecko, "traffic is still backed up as far as you can see." The hazardous material that spilled from a truck has been identified by Fort Leonard Wood's hazmat team and is not considered to be a risk to the public. At 4:17 p.m., Hazelgreen Fire Protection District Deputy Chief Jarrod Arnall reported that "all fire units have cleared. West bound traffic is down to one lane. DNR and Environmental Works, Inc. are on scene." In an unrelated wreck, Matthew R. Woods, 35, of St. Robert, was driving a 2004 Chevrolet 1500 eastbound on Highway U northwest of Crocker, about an eighth of a mile west of Berkley Lane, when he ran off the left side of the roadway about 12:30 p.m. and hit an embankment, causing extensive damage to his vehicle. Crocker Fire Protection District personnel responded and found the truck nose-down in the ditch on Highway U at the low-water crossing northwest of Crocker with one patient bleeding from the head and out of the vehicle. Woods was wearing his seatbelt and was not hurt, but his passenger, Brianna M. Kennedy, of St. Robert, wasn’t wearing her seatbelt and suffered moderate minor injuries, being transported by ambulance to Lake Regional Hospital. The vehicle was extensively damaged and removed by Gene’s Towing.